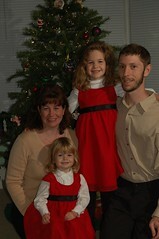 Last weekend we set up the Christmas tree, and that means it was time for the annual family Christmas picture. On the technical side, I set up things differently this year. To start with I was using off-camera flash, and while I like the lighting, it could use a lot of improvement in brightness and less red-eye. Also I got a remote shutter control for the camera so we no longer have to set the 10-second timer and then rush to get into position. So the remote is great, the lighting was decent, and once CE had taken a good nap, we got a good picture for this year.